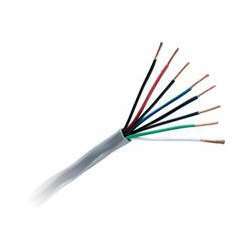 The Honeywell Genesis Cable 1118 Series is an 18AWG, 2-conductor stranded unshielded CM-CL2 cable for use in power-limited, low-voltage circuit applications, such as burglary alarms, intercoms, speakers, and public address systems. Includes copper conductors with genelene insulation and flexible polyvinyl-chloride jackets in white. Comes in a 1000ft tangle-free box. Also available in grey.